Urine Off Dog & Odor Remover - 1 Gallon is used for general use on litter boxes, linens & fabrics, furniture, carpet, hardwood floors, concrete, tile, and plywood/osb. Urine Off must contact all urine deposits on or in the surface, however far these deposits may have soaked in. Different surfaces require different techniques (see below). Urine Off must remain wet and in contact with the urine deposits long enough for the bio-enzymes to complete their work on the urine crystals. In certain cases where deposits are heavy, very old, or other urine odor/stain products have been used, more than one Urine Off treatment may be needed. The more absorbent the material, the more Urine Off will be required. NEVER spray on pets or people. 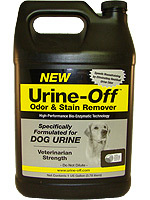 Urine Off is mild and safe to use around pets and people but is not designed for topical use! ALWAYS check fabrics for colorfastness in an inconspicuous area. Again, Urine Off is mild and safe to use on water-safe surfaces, but play it safe and test first! Do NOT use directly on pet litter - this is ineffective. If the litter has a urine odor, change it. Urine Off is great for the litter pan itself, however (details below). NEVER use other cleaners or chemicals of any kind at the same time as Urine Off - this will reduce its effectiveness. Use Urine Off first! If other chemicals have already been applied, be sure to rinse repeatedly to remove all traces and allow to dry completely before using Urine Off!